My Vanity is a mess; I can hardly find a thing. This weekend is reserved for arrangements, sorting and discarding. I still have Sephora Makeup Samples gah! The Mod Mix is about Fresh Face: Minimal Makeup paired with the 60’s Crease-cut (that turned out bad.) I corrected my darkness under my eyes with NYX Concealer in medium and kept my face extremely minimal by buffing Rimmel Staymatte on my Face. Further, I applied Lightest Shimmery shade on my eyelid and black, the darkest for Crease. I layered the black using Noir from Sleek Au Naturel. 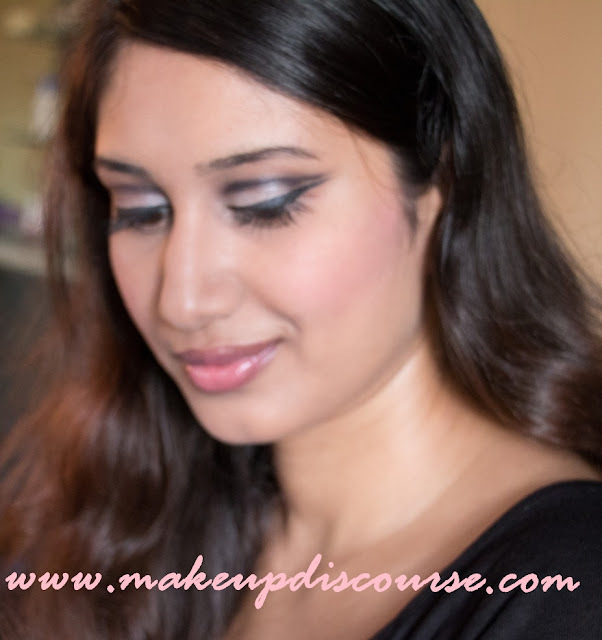 Winged out using Maybelline Gel Eyeliner and finished off using Bourjois Beautyfull Mascara. I stippled NYX Cream Blush onto the Apples of my cheeks. And I finished off with a hint of same blush topped with Revlon Colorburst in Papaya. I skipped Contouring & Highlighting too. I couldn’t find Eyeshadow primer, any. So the eyeshadow creased. I chose the wrong lid base, the pigmentation is fine but it creased and you will see that below.